For all chocolate lovers, Slim & Sassy Chocolate TrimShake is a low-calorie and delicious weight management mix created to help fight hunger cravings and enhance energy levels while alleviating fatigue. doTERRA Slim & Sassy TrimShake is a convenient and delicious weight management shake mix that provides essential nutrients and only 70 calories per serving. Blended with water or nonfat dairy, almond, rice, or soy milk, TrimShake can be used as part of a weight-loss strategy of reducing daily caloric intake and burning fat stores through exercise. Slim & Sassy TrimShake includes the patented weight-loss ingredient EssentraTrim†, which research has shown to help manage cortisol—a stress hormone associated with fat storage in the abdomen, hips, and thighs. 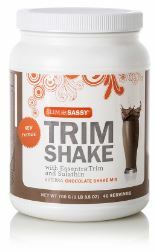 Slim & Sassy TrimShake also includes Solathin‡, a special protein extract from natural food sources that supports an increased feeling of satiety. Available in natural chocolate and vanilla flavors, TrimShake blends well with water or milk and provides 8 grams of protein and 2.5 grams of fiber per serving. Blend one scoop of shake mix in ½ cup of water or nonfat dairy, almond, rice, or soy milk until smooth and creamy. Also blends well withfruits and vegetables. For unique flavor options, blend one drop of your favorite doTERRA essential oil in shake. Serve chilled.